My daughter has been having a rough time at school when it comes TESTING. She will study and when she gets the test she goes blank. She is very smart but when it comes to test she gets below grade level every time. Her teacher has tried a couple different things with her like putting headphones on, take test in office, and oral testing. However, none of them really helped her. When I was offered to review Sleep’n Sync CD I was excited about another option to help my daughter. I play it Sunday- Thursday in her room after she falls asleep. We discussed about her Friday test and what she wanted to happen- she wanted a 100%. On the day of the test I made her a healthy breakfast with fruit and oatmeal. We were very positive and she was prepared to take the test. We reviewed all week, like we do all the time. Her confidence was higher than usual and I loved that. She came home and was acting a little sad so I thought she didn’t do very well on the test but I kept positive. She was fooling me…she pulled that test out and did a little dance. She got a 100% and for the past 3 weeks she has gotten a 100% so I’m a believer in this program. Sleep’n Sync, a revolutionary, audio soundtrack that helps children become more receptive and acquire skills needed to live optimistic, successful lives was created to help children overcome such issues. 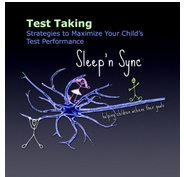 The Sleep’ N Sync team provides helpful tips on how to identify what type of learner your child is and how you can prevent failure in school . Please see more information below. Keep the child active and actively engaged. Ask questions that require an answer. Make sit down tasks a sensory experience; put sandpaper under the writing paper, use an incline or easel, have them sit on an inflatable cushion. Use high intensity sensory- based activities (e.g. exercise breaks, trampoline games) to increase their arousal and processing. Limit environmental stimuli whenever possible: use study carrels, noise cancelling headsets or headphones to deliver calming music. Use heavy work and exercise throughout the day to lower sensory threshold e.g. rearranging books or chairs, bringing in the groceries, isometric exercises, or even treadmill walking. Use visuals, schedules and sensory stories to help them know what to expect and be able to handle new environments. Teach them to recognize when they are getting overwhelmed and to seek out strategies that will help them, (seek out the headphones, do deep breathing or closing their eyes and breathing deeply). Implementing audio with an engineered background soundtrack with binaural beats, Sleep’n Sync synchronizes the child’s brainwaves, creating greater receptiveness while the child is asleep. Results are evident in as little as six weeks. Sleep’n Sync works to builds self-confidence, aids with reading comprehension and helps cope with anxiety and issues such as, autism and ADHD. The program includes audio that should be played on a daily basis while a child is sleeping, during a relatively short period of time. In addition, Sleep’n Sync provides recommendations and advice for parents or caregivers, in the form of a booklet, created by Sleep’n Sync’s experts. The program is designed to help synchronize the conscious mind with the subconscious mind of a child; and with the caregiver’s support, it provides the best scenario for the child’s goal achievement. Sleep’n Sync also includes a user friendly evaluation form as a tool to measure the child’s progress and final results. We highly recommend Sleep’n Sync.